Melbourne looks set for another bumper year in 2019 with a host of key projects around the city - of both the small and tall variety - changing not only the skyline's silhouette but more importantly its ground plane. Today's piece focuses on a selection of projects which in some way will contribute to improving Melbourne's built environment and public realm. These projects represent a cross section of skyscrapers and key public realm projects. 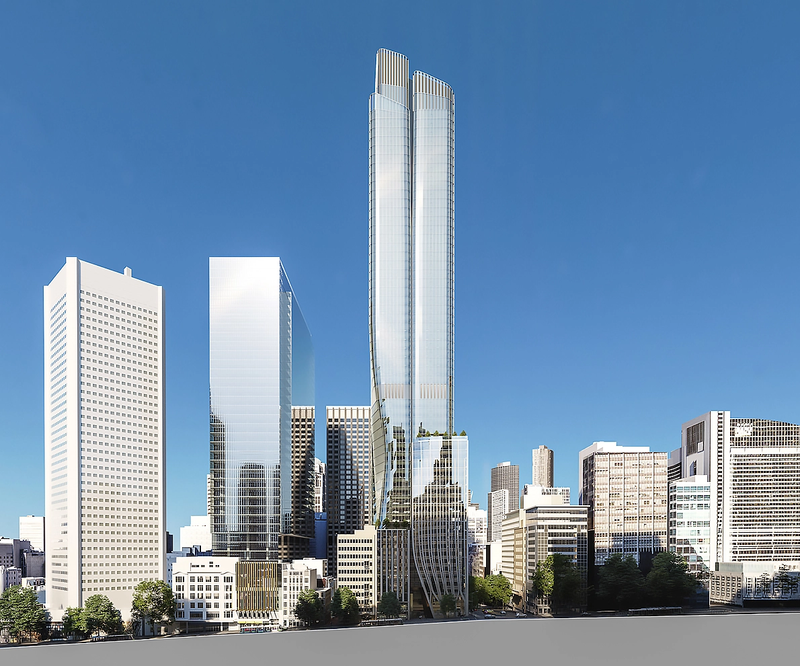 Cbus Property delivered an early Christmas package to the City of Melbourne when it submitted an application for a $1bn 55-storey commercial tower at 435 Bourke Street, in the heart of the Melbourne CBD. Designed by Bates Smart, the development comprises approximately 64,500 sqm of premium grade office space on the corner of Bourke and Queen Street. Cbus amalgamated sites at 140 and 150 Queen Street, 423 Bourke Street and 27 McKillop Street to allow for the development. According to Cbus, it intends to launch 435 Bourke Street in early 2019 and commence construction later this year pending planning approval. Beulah International revealed the six entries in its Southbank by Beulah competition during its symposium in July 2018, before Cox Architecture + UN Studio's Green Spine scheme as the winning design. The design team and Beulah then embarked on a study tour which included stops in Shanghai and New York to assist in informing the design. It is expected that following a process of design refinement and development a planning application will be lodged for the site at 118 City Road, Southbank. 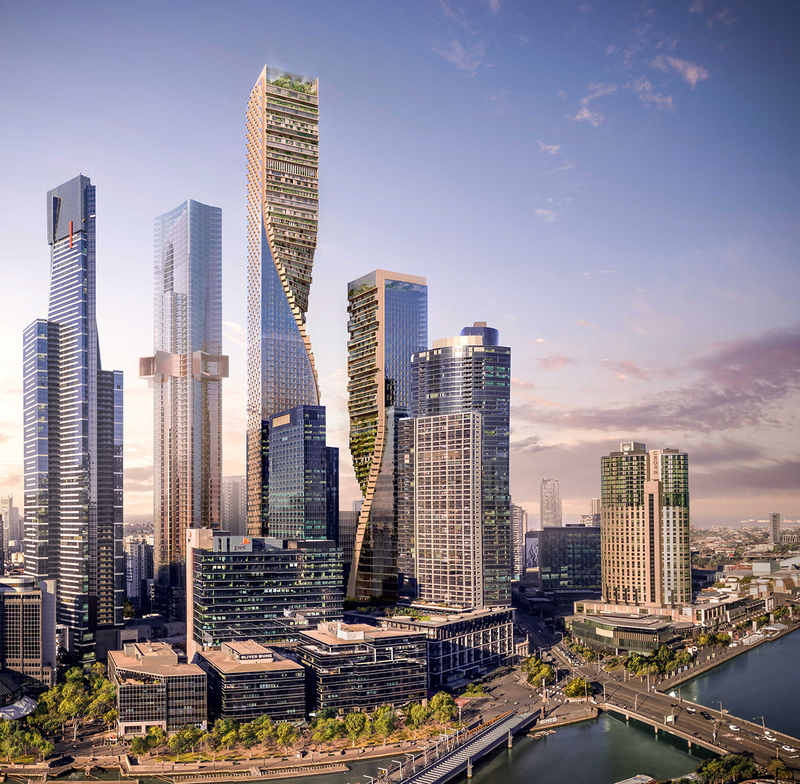 Should the project retain a maximum height of 356m and should it be viewed favourably by the Planning Minister's office, construction could commence on what would become Australia's tallest tower in 2020 at the earliest. 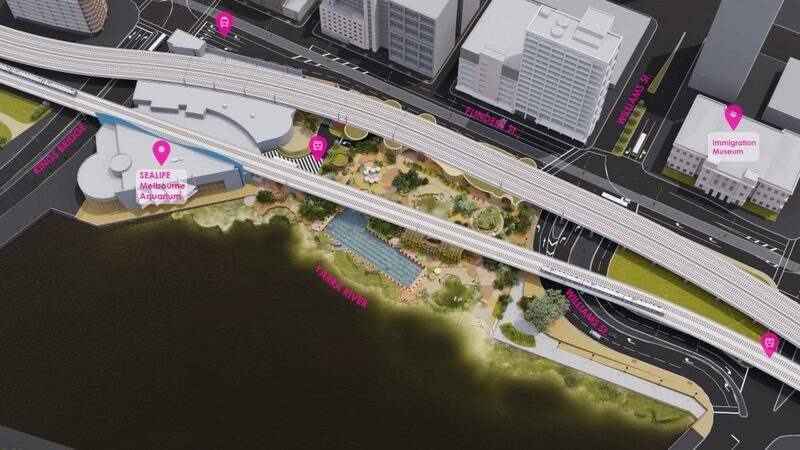 The winning concept for Green Spine featured a mix of uses including residential, commercial, hotel, a school and a highly permeable ground plane which extends the Southbank Boulevard linear park (see below) into the site and extends up the length of the towers. For more details on the Green Spine and to view the other entries click here. Designed by WOWOWA and inspired by urban river swimming projects both locally and globally, Yarra Pools is a community-led proposal which seeks to transform an under-utilised section of the Yarra River's Northbank into a thriving community facility centred around water-based activities. The proposal would include (amongst other things) wetlands, a natural leisure pool, 50m lap pool, kids pool, cafe and pavilion. Yarra Pools is currently seeking support to advance the project through a community-led, multi-staged design and construction process. You can read more about the Yarra Pool concept here or give your feedback on the new design here. The first stage of City of Melbourne's significant project for Southbank has commenced with tram infrastructure works already completed between St Kilda Road and Sturt Street. Construction is now underway on the remainder of Southbank Boulevard between Sturt Street and City Road. This portion of the project will be undertaken in a number of stages and will see the west bound carriageway discontinued to create new public open space, and the current east bound one way carriageway converted to two way traffic. The first stage is due to be completed in August of this year. Upon completion, the six stages of the project will create 2.5 hectares of public space and neighbourhood parkland within Southbank, which has become Melbourne's most densely populated suburb. 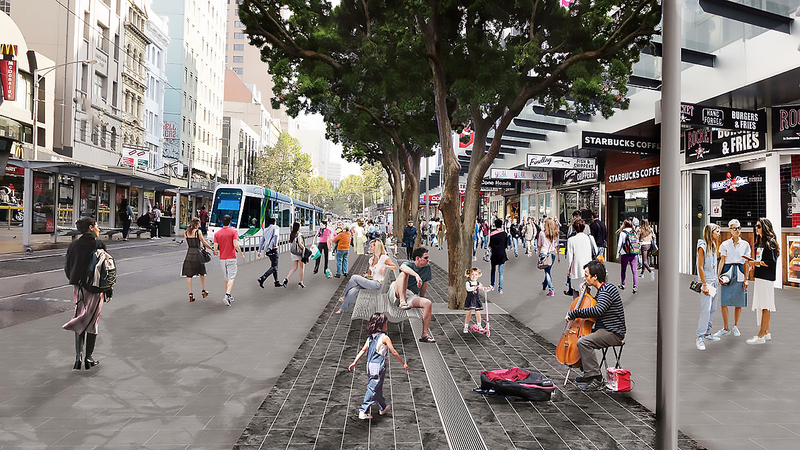 Work is finally set to commence by the middle of this year on the City of Melbourne's long mooted pedestrianisation of Elizabeth Street South which will replace a stretch of road surface with a new tree lined public space. Originally due to begin early last year, the project was delayed to allow for construction of an office development at 276 Flinders Street. The 10-storey development is nearing completion and has direct frontage to the section of Elizabeth Street to be transformed, limiting Council's ability to build the new public space immediately while maintaining pedestrian safety around the construction site. The City of Melbourne has set aside $2.2m to complete the project which will include the creation of better public realm with new bluestone paving, street furniture, lighting, trees and drainage improvements. Being delivered as part of Cbus Property and ISPT's $1.3bn Collins Arch development currently under construction, the Oculus-designed park along Collins and Market Streets will add much needed green space to the heart of Melbourne's CBD. To facilitate development of the park, City of Melbourne is contributing part of the Market Street road reserve while Cbus Property and ISPT are contributing part of their development site. The new 1,900 sqm park comprises five distinct zones; Collins Street Interface, Northern Lawns, Playful Terrace, Central Plaza, and City Garden. 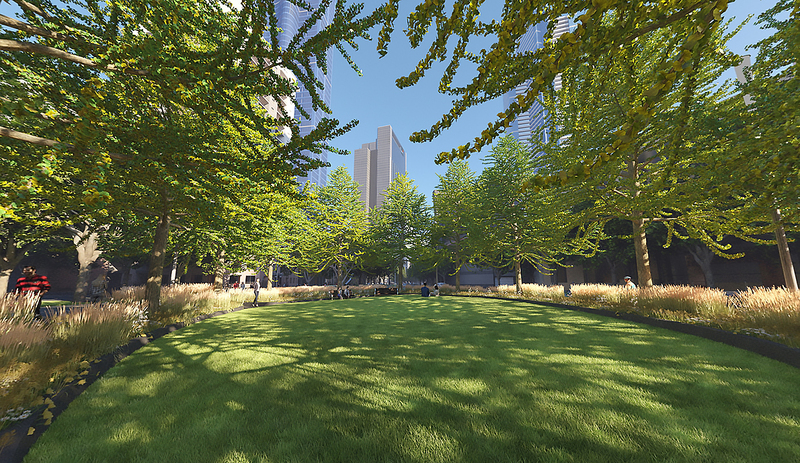 Upon completion the park will be vested back to the City of Melbourne for public use and management. 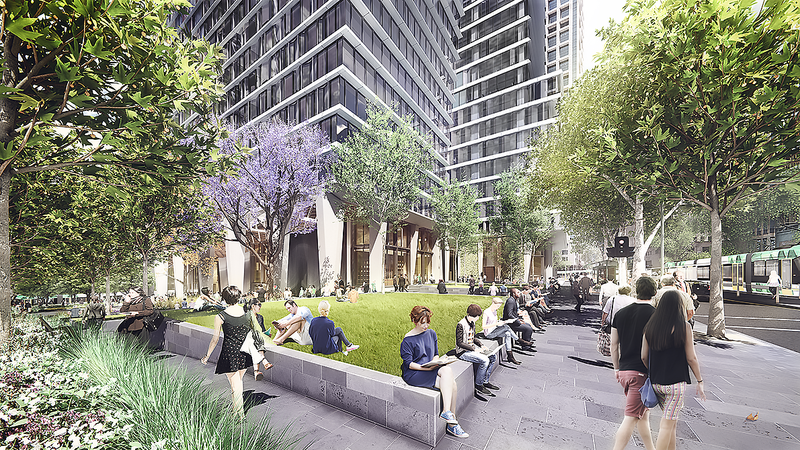 Construction at Melbourne Square is racing ahead at OSK Property's $2.8 billion Melbourne Square project in Southbank. The six-tower project comprises four residential towers, an office building and a hotel sited around a new central public space. The first stage is 75% sold and features two residential towers of 231m and 179m respectively, the public park and a full line Woolworths - Southbank's first full line supermarket. The 3,700sqm park has been designed by Taylor Cullity Lethlean and encompasses more than 20 per cent of the overall site Read more about the park here. It was also recently reported in the AFR, that OSK was negotiating with Hilton Hotels & Resorts to operate a 600-room flagship luxury hotel with an anticipated opening date of 2022.